Colony Collapse Disorder: Are there any facts out there? 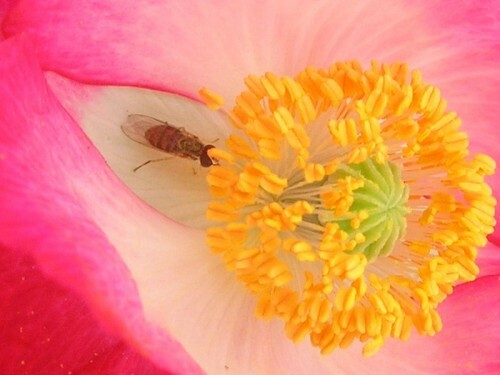 This looks like a bee visiting a corn poppy, but really it’s a fly. This comment explains. Perhaps, like me, you’ve noticed there haven’t been as many bees flying around this year. If you’re the sort of person who gets nervous around bees, this might even seem like a good thing to you. But perhaps, like me, you notice your apple trees have scarcely any apples on them, and you know that the flowers weren’t damaged by a late frost. This is not a good thing. Multiplied by millions of fruit and almond trees in orchards all over the country, it becomes a very bad thing. They’re calling it Colony Collapse Disorder (CCD). It’s called a disorder because no one knows why it’s happening. Especially in the beginning, there were a lot of wack-a-doo theories circulating around. When something bad happens and the explanation isn’t immediately evident, the human race tends to look around for something–or someone–to be the heavy. It’s easy to blame something equally invisible, like cell phone transmissions, or your favorite arch-enemy, like pesticides, when you don’t know what the heck is causing this scary business. Lipkin had just sent off a paper on C.C.D. to a scientific journal. He was reluctant to discuss its contents, for fear of jeopardizing its acceptance, but he did indicate that it contained what he considered to be a breakthrough. One pathogen in particular was, in his words, â€œhighly associatedâ€ with C.C.D. That article was published on August 6th. I wondered if Lifkin’s study had been published since then. I couldn’t find anything by googling for it, but I did find “As bees go missing, a $9.3B crisis lurks” by David Stipp. This covers a lot of the same ground as Kolbert’s article, but adds some new information as well. As you might expect from a Fortune magazine article, the economic ramifications of the problem are covered in more depth. Stipp also discusses other possible causes in addition to the ones that Kolbert suggested. But his article, published at the end of August, also mentions Lifkin’s apparently still unpublished study. But merely showing that germs selectively turn up in cases of CCD, he cautions, won’t necessarily nail the culprit, for it will leave a key question unanswered: Are such microbes the main killers, or has something else stomped bees’ immune systems, making them vulnerable to the infections? Competition from imported honey causes commercial bee-keepers to change their bee husbandry practices, as does increased demand for pollination services. Many pesticides used for commercial agriculture and home lawn maintenance are known to be harmful to bees. Good weather mitigated the reduced availability of bees, so crops of bee-dependent produce were still good. This kept prices low and legislators ignorant of the coming economic debacle. And as Craig Cramer of Ellis Hollow pointed out, lack of genetic diversity in honeybee breeding lines may also play a part. There are a lot of threads tangled together, and the whole ball of yarn won’t be unraveled for a while. Probably the smartest thing anyone can do is plant as many of the plants bees and other pollinators favor as they can. We think this has helped our vegetable garden. Several people in the neighborhood used to keep bees, but they have all given it up, not because of Colony Collapse Disorder but because of other bee diseases or the infirmities of the bee keeper. Our tomatoes are setting fruit, while some other gardeners on the street aren’t having much success. We like to think Talitha’s practice of planting corn poppies, cosmos and other posies in amongst the vegetables attracts more pollinators to the vegetable patch. But if Daughter of the Soil is right, we’re probably fooling ourselves, at least in regards to tomatoes. I noticed that the “bee” in your beautiful corn poppy photo is actually a fly. Many flies are bee mimics and this one looks like a syrphid fly. It may well be a pollinator, but many have larvae that are parasitic (some are considered beneficials). Though you can’t see them in this photo, flies have little knobs instead a 2nd pair of wings. You can see the extremely large eyes. Fly antennae are also very different, but hidden in this photo. Thank you, Nancy, for the education. I’ll change the caption to reflect your identification. In regards to Colony Collapse Disorder, I’d like to share what I know about bee keepers here in Michigan. To my knowledge, there has been no incidence of CCD in Michigan. This is purely antedotal, but some folks in this state seem to think the problem could be related to a combination of factors, not the least being that the bees are getting a little worn out from traveling and possibly even overdue maintenance on hives. These factors, and others, including pesticides and predators, could be causing the bees to leave the hives. PBS and 60 minutes recently ran stories on the problem. The PBS documentary seemed to suggest that we need to get the bees out of the rat race that we humans are in ourselves. In other words, perhaps it’s time to give the bees a little break, clean up the hives, improve nutrition to the bees, etc. In the mean time, we should keep planting plants in our own garden that will attract pollinators, and of course reduce or eliminate the use of pesticides. The People, Places and Plants site has an interesting article on whether lawn grub control products are contributing to CCD. I hope you don’t mind me pasting it here. It probably won’t be up forever, and they don’t have a convenient direct link. The onset of autumn always brings heightened advertising for grub control products for lawns. With the winter of 2007-2008 not far off, however, comes an urgent reminder from beekeepers about Colony Collapse Disorder (CCD), which wiped out tens of thousands of hives of bees across North America last winter and spring. That desire for a grub-free lawn has placed some homeowners and landscape contractors in direct conflict with the bee industry. In addition to the production of honey, honeybees pollinate approximately one-third of the food consumed by Americans, according to a Cornell University study. Among the most common crops that require pollination by bees are apples, nuts, avocados, soybeans, asparagus, broccoli, celery, squash and cucumbers. Numerous fruits also need bees, including, citrus, peaches, kiwi, cherries, blueberries, cranberries, strawberries, blueberries, cantaloupe and other melons. Colony Collapse Disorder was coined in 2006 as catch phrase for a disturbing, unexplained phenomenon that caused nearly a quarter of U.S. honeybee colonies to disappear within a few months. Though many thought the problem was limited to western North America, beekeepers across the United States, Canada and Europe also reported the problem that is posing a threat to the worldâ€™s food supply. The cause of CCD is greatly disputed, but many have begun to focus their theories and research on imidacloprid, a recently registered nicotine-like synthetic pesticide that is commonly used in flea and tick products, as well as for termite and grub control. Other target insects include aphids, whiteflies, thrips, mealybugs and beetles. Products that contain imidacloprid include Admire, Confidor, Connect, Evidence, Leverage, Muralla, Provado, Trimax, Premise and Winne. Though imidacloprid has been patented since 1988, its use on American crops escalated significantly in the past three years, just as Diazinon came off store shelves. In the case of bees, the imidacloprid apparently does not directly kill the colonies, but may disorient the bees and cause them to disband â€” at least according to beekeepers who are closely studying the issue. Eric Lane agrees. The California beekeeper said he can trace the origin of Colony Collapse Disorder to 2003, the year imidacloprid was approved for use in his state. He estimates he lost 80 percent of his bees last winter and said he was not surprised, based on his prior research. Hackenberg, Lane and many others are calling on farmers and homeowners to eliminate the use of Merit and other products containing imidacloprid, at least until someone can prove that the chemical is not the problem. Bayer AG, the aspirin and chemical manufacturer that originated the patent on imidacloprid, has reportedly paid for dozens of laboratory tests and sharply denounces any speculation that its product harms bees when it is applied according to directions. Research at Penn State and elsewhere, however, has suggested potential links to bee decline and the new pesticide. Dr. Jerry J. Bromenshenk, a research scientist at the University of Montana is a member of the nationwide CCD working group of scientists that convened to study the phenomenon last year. Though he said he is still skeptical that imidacloprid is the entire cause of the bee decline, he has testified on behalf of beekeepers who have lost hives due to imidacloprid exposure. In a report published in June by the Congressional Research Service, imidacloprid was named as a likely cause of the beesâ€™ demise. â€œThe scientists studying CCD note that the doses taken up by bees are not lethal, but they are concerned about possible chronic problems caused by long-term exposure,â€ according to the CRS report. As noted by the National Research Council, some studies report sublethal effects of pesticides that may impair the navigational and foraging abilities of honeybees. According to registration papers filed with the U.S. Environmental Protection Agency, imidacloprid is moderately toxic to humans, and manufacturers are required to place a â€œCautionâ€ or â€œWarningâ€ designation on product labels. The EPA further classifies imidacloprid as highly toxic to bees and upland game birds. Given all of this information, many American farmers arenâ€™t willing to take any chances and are forsaking all products containing imidacloprid. That also leaves many homeowners in a quandary this fall, just as many companies begin advertising promotions for grub control products such as Merit. Grubs, which are the larvae of flying and chewing insects including Japanese beetles and European chafers, cause lawn damage by eating grass roots. Skunks and moles also can make a mess of a lawn when they tunnel and claw in search of the grubs as a food source. To combat grub infestations, Tukey suggests other approaches that donâ€™t involve chemicals, including the use of naturally occurring beneficial nematodes, which are nontoxic, as well as organic soil management. The issue of imidacloprid and bees, according to Tukey, is yet another reason why homeowners should always be careful when considering chemicals in their lawn care and landscaping. Chemicals, nearly all chemicals, pose risks if used improperly; some are problems no matter what. For the beekeeping brethren, no further warning is necessary. Check Out the numerous resources for education, such as http://www.melna.org or http://www.rodaleinstitute.org . For video tips specific to organic lawn care, you can now visit http://www.SafeLawns.org. Paul Tukey, August 30, 2007. We have a massive amount of native bees around here – everything from the smaller colony bees to the humongous bumble bees. My neighbors and I were talking the other day about the coneflowers being (literally) covered with bees – 3 – 4 or even more to a flower. It’s actually wasps and hornets that seem to be of lower population around here. However, the dry weather is helping the yellow jackets out and their numbers are expanding exponentially. Welcome to SJPasch and Mr. McGregor’s Daughter! When we moved here over 15 years ago, there was a “bee tree” on our acreage that has since been abandoned, perhaps for the same reason our neighbor two houses down gave up beekeeping. Most of the forest in our area is second or third growth. There are some dead trees, I am sure, but who knows what other factors can stress a hive or keep it from surviving over the winter? All of your comments show that the quantity of honeybees in a locale can be very variable. I’ve had plenty of honeybees & bumblebees all year here in my garden in Northwest suburban Chicago. What is strange is that this weekend I did not see a single bee on the sedum at my mom’s house, in a nearby suburb. In years past, it seemed as if you could not see the flowers for the bees on her sedum. A few miles apart, what a difference. What’s up with that? I think Ellis Hollow makes a good point about wild honeybee habitat. There’s a tendency in suburban and urban neighborhoods (for safety as well as aesthetic reasons I’m sure) to get rid of dead or failing trees with excellent hollow spots for hives. At Blithewold we’ve been watching a hive in a dying chestnut and were able to save the hive by stumping the tree a few feet above the hive site. The bees seem to be doing fine although they haven’t swarmed and split off – I think by now, they usually have. The news on CCD has been scanty since early summer, so it was with gratitude that I stumbled across your web site and your very recent article. It is a tragedy that the cause and cure have not yet been discovered. I would like to share my Chicago observations regarding CCD – and the ripple effect that has occurred in my area: I am an avid gardener, so I am outside most days and have ample opportunity to notice what is going on. During the month of May, I did not see more than half a dozen honeybees, and it was not from lack of flowers â€“ from ground level up into the fruit trees – to attract them. June brought the onslaught of Brood XIII of the 17-year Periodical Cicadas, and the birds and squirrels gorged themselves on protein-rich food. In July, there was not a single little green apple or peach growing on the trees, and this has not occurred in the seven years I have lived here. The wildlife always strips the fruit trees clean while the fruit is still inedible for us. This year, fortunately, they had cicadas, so at least they did not starve. The squirrels craved fruit, though, so they finally resorted to eating our little-green-tomatoes, which they ordinarily scorn. Gardeners all over the Chicago area relinquished the pleasure of homegrown tomatoes this year. We had no choice. Still, all the way through August, there were plenty of other bees, but honeybees were absent from my gardens â€“ only a couple here and there. Today, September 3, the honeybees mysteriously reappeared, even more abundantly than in past years. It is too late for the fruit, but it is a relief to see them again. I noticed a definite decline in the number of bees visiting my gardens this year. Even bumblebees. In prior years, I’ve always warned people who wanted to see my flowers that if they were afraid of bees, they should stay away because there were always so many bees in my yard. Sadly, this year, I have not had to issue that warning because there have been so few bees. It’s very frightening. Kathy, thank you very much for this article. I don’t have anything to add, but I do want to compliment you on writing it. I greatly admire the way you have with discussing topics like these: giving out great, complete information while refraining from rushing to conclusions or nudging your readers toward the answers that you suspect or would prefer they reach. Another thought: Honeybee habitat is more than planting plants they like. With the decline in hobby beekeeping, there aren’t so many domesticated colonies dotting the countryside. Where else do bees live? Cavities in big old dead trees, I suspect. The kind that forest management plans that don’t take local wildlife into account say to take down and turn into firewood. I am happy for all of you enjoying more bees than usual. And I want to make clear that we still do have pollinating insects showing up, but the honeybees aren’t as numerous as they once were. It used to be our blooming apple trees would be humming with hundreds of bees at a time; this year, if you looked hard, you could pick out one or two. Jodi, from reading the two articles, I understand that with CCD the nurse bees are abandoning the brood, something that hasn’t been seen with other bee diseases and which really freaks out beekeepers. Ellis Hollow, the trees were planted by the previous owners, and I don’t know what variety they are. The blossoms often get damaged by late frosts, disrupting whatever bearing schedule they might have. All this is to say, if they are on an alternate bearing schedule, we haven’t been aware of it for the above reasons. I think part of the ebb in coverage has to do with the time of the year. Colonies die overwinter. It gets reported in the spring. Story goes away in our attention-deficit media. I’d like to see more stats on the relative devastation of the disease on ‘trucked around pollination services’ colonies and those that are relatively stable, maybe moved occasionally short distances but not transported all over following the flowering of commercial crops. The trucked around colonies get fed a lot of syrup when they aren’t out foraging on their own, if I understand commercial colony management, in addition to facing many stresses not faced by ‘stay at home’ colonies and wild bees. Kathy: Are your trees on an alternate year bearing schedule? That might explain some of your thin crop this year. It does seem like we have even more bees than usual this year, and other gardeners in our area have commented on it too. Though I can’t say what kind of bees they are either. We have plenty of bees at our place, which is very pollinator friendly; lots of native and old fashioned species of plants, (including some that others might call weeds) lots of hybrids too, but also plenty of native shrubs and trees; and not an insecticide or fungicide in sight. There has been no record of Colony Collapse Disorder in Nova Scotia, and onebeekeeper I interviewed found no larger-than-normal mortalities this past spring; and his honey harvest is larger than it has been in a few years, too. His feeling is that honeybees, not being native to North America and being prone to a whack of diseases, do face a lot of challenges including erratic weather patterns in winter and general disease susceptibility. He wonders if some of the hysteria ovder CCD is just that–hysteria, due to a poor pollination of the almond crop in the US–but also notes that pesticides such as the neonicitinoids (sp) are highly toxic and tend to be broad-spectrum. Whatever the case, he agrees that it all bears watching. I’ve been waiting for months to hear more information about the disappearing bees. Thanks for bringing it up again. In my own yard, the bees seem to be more plentiful than ever, buzzing happily over the coral vine and the garlic chives. Is it because we’re having wetter than average weather down here in Austin? Is it because I now have a pond? Or maybe these are not honey bees but other kinds of bees. Very interesting and informative. I’m looking forward to reading more of Lifkin’s theories. Reports around Indiana are that in this area they have not seen CCD, which doesn’t mean we won’t see it at some point, just right now, our bees are doing okay. But the sooner a cause is known, the sooner actions can be taken to stop it, whatever “it” is.